COMMENTARY ON "SUFFERING FOR CHRIST"
This week’s lesson is titled “Suffering for Christ” and draws primarily upon 1 Peter, an epistle written to Christians that were evidently undergoing significant persecution at that time. 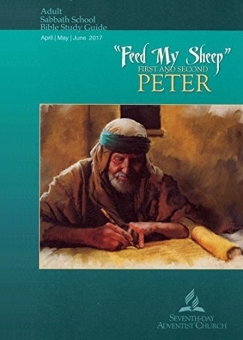 The lesson rightly notes the theme of persecution in 1 Peter, illustrated by similar bookends: 1 Peter 1:6 in the introduction, and 5:10 at the conclusion. As will be shown, however, the author fails to understand the significance of suffering in the life of the believer, especially as it relates to the biblical gospel and the Seventh-Day Adventist Great Controversy worldview. Today’s lesson goes through 1 Peter 3:13–22, primarily stressing the importance of making sure that when we are persecuted, it is for righteousness’ sake, and not for any other reason. This is certainly a valid understanding of this passage, but the lesson fails in places to examine the deeper reasons behind the suffering that all Christians are promised to some degree (2 Tim 3:12). In the Great Controversy worldview, Satan and God are almost portrayed as equal agents active in human affairs. This distinctly Seventh-Day Adventist understanding fails to appreciate the fact that, while Satan may be the immediate cause of much human suffering, God is not therefore out of the picture like some bystander watching what is going on. The biblical God is ultimately sovereign over Satan and even over suffering, and is using both for His glory and the good of those who love him (Rom 8:28). A number of points of discussion in the lesson illustrate this misunderstanding. Although 1 Peter 3:17 is mentioned, the lesson overlooks the fact that the verse explicitly states that it may sometimes be God’s sovereign will for believers to suffer, not because they are being punished for their sins, but rather to impress the gospel upon the hearts of unbelievers. Finally, the lesson notes that Jesus Christ is mentioned by Peter as the supreme example of one who suffered for righteousness’ sake. Quite obviously, the Jews, Romans, Herod, and Pilate caused Christ to suffer. But here again, the lesson does not clearly explain the nature of this suffering, only stating “His suffering brought about the only means of salvation.” In point of fact, Christ experienced suffering under the righteous judgement of God because he stood in place of sinners––the just for the unjust. The suffering that brought us peace was not primarily at the hands of the Romans, or other humans, but by the will of the Father, who put forth his own dear Son as a propitiation for undeserving sinners. This lesson goes through 1 Peter 4:12–14 but fails at every point to explain why Christians should rejoice when sharing Christ’s sufferings. The author seems to paint a distinctly man-centered perspective when paraphrasing Peter at the end: “Yes, persecution is bad, but don’t be discouraged by it as if it were something unexpected. Press on ahead in faith.” It is instructive to simply quote and contrast Peter’s own words in these verses: “But rejoice insofar as you share Christ’s sufferings, that you may also rejoice and be glad when his glory is revealed. If you are insulted for the name of Christ, you are blessed, because the Spirit of glory and of God rests upon you” (1 Peter 4:13–14). Peter is very boldly declaring that anyone who is insulted for the name of Christ has great reasons for rejoicing, quite simply because this is evidence that he or she has been born again and now belongs to Jesus Christ. Already in the first chapter, as mentioned before, Peter gives believers a reason to rejoice in suffering, namely that this would be a means of testing and confirming the genuiness of one’s faith in God’s Son (v. 7). Since the new birth is largely incomprehensible to most Adventists, these verses may not make much sense. This lesson’s instruction to read Revelation 12:17, a favorite proof text of SDAs, hints that the author’s understanding of 2 Timothy 3:12 (“…all who desire to live a godly life in Christ Jesus will be persecuted”) is skewed. The referrent of “commandments of God” in Rev 12:17 is popularly understood by Adventists to mean the Ten Commandments of Moses (especially the fourth commandment), while the “testimony of Jesus” is held to be the prophetic ministry of Ellen G. White. Lost in both Rev 12:17 and 2 Tim 3:12 is the person of Jesus Christ, who viewed himself as one greater than Moses, and was even prophecied to be such by Moses himself (Deut 18:15). While space does not permit a full discussion of the relationship between the Mosaic law and the New Covenant, suffice it to say that the fundamental reality of the believer in the New Testament is expressed by his or her position in Christ (cf. 2 Tim 3:12). This phrase occurs no less than 76 times in the New Testament, and it is a deep spiritual truth that is at the very heart of the gospel. Today’s lesson goes through 1 Peter 4:17–19, and while it highlights that suffering may be “according to the will of God” (v. 19), it completely misinterprets the understanding of God’s judgement in relation to believers by making a comparison with an unrelated parable in Luke 18:1–8. Jesus gave this parable of an unrighteous judge in order to illustrate God’s promised vindication to those who ask of him earnestly. The author asserts that this is the understanding of judgement implied by Peter in 1 Peter 4:17–19, namely a positive act of God to make things right in the world and correct injustice. The reader is not instructed to read these three verses in context, which clearly rules out the author’s interpretation. Beginning with verse 15, Peter warns believers not to suffer for any wrongdoing. He should instead behave in a manner that glorifies Christ. He then gives one reason, stating in verse 17, that judgement is to begin with the house of God. The apostle Paul says something similar in 1 Corinthians 5:12–13, stating that judgement within the church is meant to purify her. True believers are never judicially judged for their sins––Christ has paid it all on the cross––but neither does God simply leave his children be. Anyone who is a born-again Christian has been adopted into the family of God and is promised loving discipline from the Father, according Hebrews 12:6. God’s discipline can sometimes even be quite severe, as 1 Peter 4:18 (the verse immediately following) notes. Here again, however, the context of verse 19 indicates that believers can entrust their souls to a faithful Creator. He no longer comes to them as a judge, but as a loving Father. This lesson stresses the Seventh-Day Adventist of the Great Controversy as an answer to the problem of evil, expressed in the question: “Why do we suffer?” Three texts are advanced as explanations for this philosophical question: 1 Peter 5:8, Rev 12:9, and Rev 2:10. All three passages identify Satan as the primary agent of evil in this world. The example of righteous Job is given as support for the doctrine of the Great Controversy, yet the author fails to understand that at every point that Satan afflicted God’s righteous servant, he did so only by explicit permission of the Creator. In Job 1:12, God permits Satan to afflict his possessions and family, yet forbids him from touching Job. In Job 2:6, Satan is permitted to afflict Job, but forbidden from killing him. At each stage, Satan must be first allowed to do anything to Job, and never is he given free rein. Far from being a conflict between two equal parties, then, the story of Job illustrates how God remains God, and causes even the suffering that Satan inflict upon Job to result in glory for Himself and ultimate goodness for His servant. From a Seventh-Day Adventist perspective, then, suffering is outside the direct control of God, since He prefers to give deference to His creatures. This, however, is an unbiblical view of God’s sovereignty. This week’s lesson concludes with a discussion of Pliny’s letter concerning the persecution of early Christians. Given the author’s citation of Revelation 14:9–12, the lesson’s implicit answer to the question––“What was the main issue that Christians faced, as revealed in the Pliny letter quoted above?”––is that Christians are primarily persecuted for their obedience to the law of God (however that is defined). Nevertheless, a simple reading of Pliny’s letter reveals that the life-or-death dividing line was whether or not the Christian would offer incense to the gods and curse Jesus Christ. In other words, one’s identification with the Son of God was all that was needed for a Christian to be deemed worthy of death. It is certainly true that a believer in Jesus Christ will strive to be joyfully obedient to his Lord, yet this obedience is the fruit of a much deeper reality––the believer has been born again and now loves Christ, though he has not seen him (1 Peter 1:8). The good news of Christ’s life, death, burial and resurrection is the primary motivation in the Christian life. It is also the most offensive thing to the unbeliever, whether in ancient Rome, or modern-day America. Copyright 2017 BibleStudiesForAdventists.com. All rights reserved. Revised April 11, 2017. This website is published by Life Assurance Ministries, Camp Verde, Arizona, USA, the publisher of Proclamation! Magazine. Contact email: BibleStudiesForAdventists@gmail.com.